The Hurricanes and the Chiefs will go head to head on Friday night to kick off a Super Rugby finals series with a match that is hard to pick. Join The Roar for live scores from the match and a live blog of the game at Westpac Stadium, starting from 5:35pm AEST. The Hurricanes and the Chiefs have been two of the most impressive seasons of all the sides in the Super Rugby competition, but because of the conference system the Chiefs have been forced to travel. These two teams each took 11 wins from the season, and were second only to the Crusaders in terms of overall wins for the year. 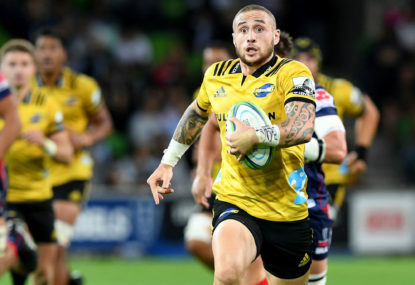 The Hurricanes thanks to two more bonus points than their opponents have reached fourth place on the overall table – moved below conference winners the Waratahs and the Lions, which gives them home advantage in this match. They also had a +131 points difference compared to the Chiefs’ +95. It’s funny to think that if the Super Rugby table were decided without conferences then all four quarter-finals would be hosted in New Zealand this year – instead, we get to seen an all-Kiwi clash here. As such it should be quite a treat to see two of the very strongest sides in the Super Rugby competition going up against each other. Whoever makes it through this match is likely set for the toughest test in Super Rugby – a do-or-die clash with the Crusaders in a semi-final next week. Of course, it’s possible that the travelling Sharks could upset the ‘Saders tomorrow and provide the winner of this one with an unexpectedly easy path to the final… but no one expects that to happen. Join The Roar for live scores from the match and a live blog of the game between the Hurricanes and the Chiefs in the Super Rugby quarter-finals on Friday night at Westpac Stadium, starting from 5:35pm AEST.